Even before the race, we were missing a competitor. Eric Salignon (ASM Formule 3), returning to racing after a serious road crash in late summer this year, crashed out of both qualifying sessions, and the qualifying race. The final crash put a crack in the tub of his Dallara, which meant he would not take part in the Grand Prix (even if the doctors had been prepared to pass him as fit to race). It's not unusual for panic to break out on the grid at Macau. There's a good half hour or so between the formation lap and the race start, and with such a long and tricky track the potential exists for people to whack a barrier or wall before they even get to the grid. This year it was the turn of British Formula Three's runner up, Adam Carroll (Menu Motorsport) to commit a minor indiscretion. It was made obvious when two of the Menu lads were seen legging it along the pit lane at high speed just as the traditional lion dance was about to begin. Ironically, this dance is meant to bring good luck to the competitors, and ensure a safe race. Clearly, this time out, it didn't work quite as well as it could have done, though in the ensuing outbreak of stupidity at least all that actually got wounded was pride; it could have been an awful lot worse. After a Formula Renault race in which such arrant stupidity was demonstrated that it beggared belief, everyone was perhaps inclined to believe the weekend quota of silliness had been reached (and probably exceeded). Not a bit of it! The start seemed to go well, at least in comparison to Saturday's qualifying race, with Nico Rosberg (Opel Team Rosberg) getting the jump on pole man Lewis Hamilton (Manor Motorsport) into Mandarin, and coming out in the lead. Hamilton hadn't helped his cause any by being a bit slow off the line, and Rosberg isn't a man to ignore an opportunity like that when it's handed to him on a plate. As the two of them pulled away from the pack, Alexandre Prémat (ASM Formule 3) was scuffling with Hamilton's teammate Robert Kubica for 3rd place. Meanwhile Prémat was investigating the limits a little too closely and whacked the barriers at Moorish Hill rather smartly. He was able to keep going after striking the car a glancing blow, but he had a rather nervous time over the next few minutes. What happened next was enough to put Prémat's worries into perspective however, and to make seasoned F3 watchers shake their heads in disbelief. Pushing hard to try and open a gap between himself and Hamilton, Rosberg arrived at Lisboa way too fast with his brakes locked, sideways, and promptly rammed the Dallara nose first into the barriers. As if that wasn't incredible enough, Hamilton - who was also pushing way too hard - couldn't avoid him and was stuck between the stricken Finn and the barriers. Just for good measure they were briefly joined by Katsuyuki Hiranaka (Prema Powerteam) and Danny Watts (Hitech Racing). Watts got going again and was on his way quite quickly, while Hiranaka lost quite a lot of time getting back on track. Hamilton eventually disentangled himself too, but Rosberg was out for good. In effect, Prémat had just been handed the lead, and was doing a great job defending it from Kubica, despite whacking the barrier a second time, and having a very sideways moment at Lisboa next time around. In the melee further back, Fabio Carbone (Three Bond Racing) ran into Lucas di Grassi's gearbox, bending his right front wing rather badly, but seeming not to lose any speed because of it. The battle to be fastest Brazilian was hotting up, especially as it seemed Nelson Piquet (Piquet Sports) was now out of contention, having started from the back. He might well be hauling his way up the order, but he was not likely to be able to challenge for a podium position from back there, especially given how things panned out. The Portuguese contingent was in trouble, in comparison, with Alvaro Parente (Carlin Motorsport) crashing heavily at the Solitude Esses on the second lap. The wreckage went everywhere and the officials scrambled the Safety Car for the first time so that the Carlin car could be removed. Matteo Cressoni (Ombra) had clearly picked up some debris somewhere, and the brakes had jammed, so he had to pit. Although he went back out again soon afterwards, his race was effectively over. Everyone settled in behind the Safety Car, and those watching hoped they might now all calm down a little. The order was Prémat, from Kubica, Jamie Green (ASM Formule 3), di Grassi, Carbone, Franck Perera (Prema Powerteam), Carroll, Rob Austin (Menu Motorsport), Ronnie Quintarelli (Inging) and Naoki Yokomizo (Inging). 11th placed was Marko Asmer (Carlin Motorsport), ahead of Signature's only surviving runner Giedo van der Garde. Richard Antinucci (TOM's) had hacked his way up to 13th, and had Piquet right behind him. Next was Daisuke Ikeda (Swiss Racing Team), then Kazuki Nakajima (TOM's), Christian Jones (TME Racing), Watts, Marchy Lee (Meritus) and Ho Pin Tung (Hitech Racing). Michael Ho (TME Racing) was 21st, with Rodolfo Avila (Carlin Motorsport), Hamilton, Lei Kit Meng (Ombra) and Jo Merszei (Swiss Racing Team) bringing up the rear. Two laps later, the Safety Car came back in and the race was allowed to restart, possibly an ill advised move. Green tackled Kubica in a fairly abrupt manner after Kubica misjudged the restart rather badly. The Englishman was able to take 2nd from the Pole by the time they reached Lisboa. This allowed Prémat to pull away a little, seemingly non the worse for his brushes with the barrier, while Carbone was still tigerishly savaging di Grassi, who wasn't about to give an inch if he didn't have to, despite the fact that Carbone had broken the diffuser on his rival's car when he broke his own wing. While Kubica was coming back at Green as his tyres warmed up again, di Grassi slammed the door on Carbone, and just behind them Carroll made a wild lunge at Perera and got away with it. That meant Carbone now had the Menu car looming in his mirrors, so he had to ease off, to di Grassi's considerable relief. A lap later, Perera took 6th back from Carroll, leaving the Northern Irishman to fend off teammate Austin, both of them having a fine run. Further back, Antinucci was still hacking his way through the field and had gained another couple of places, with Piquet still following close behind. A lap later, while Prémat pushed hard enough to set the fastest lap of the race to this point, Kubica was handed his 2nd place back, after Green picked up a puncture (no doubt caused by crash debris on the track) and ran wide at Fisherman's Bend, and he had to pit for fresh rubber. We were now roundabout the halfway mark, and it looked as if the race was settling down. It wasn't. All hell was about to break loose out there. It started when Ikeda crashed into the barriers and his car had to be craned away. While Kubica set the new fastest race lap, Avila went off and made a dreadful mess of his car at the Solitude Esses. With Jones also involved, the track was temporarily blocked, and a small car park developed for a short while as the Australian got going again and Avila was left to wonder what went wrong with his weekend. The Safety Car was scrambled for the second time at the end of lap 9. This time the order was Prémat, ahead of Kubica, di Grassi, Carbone, Perera, Carroll, Austin, Quintarelli, Yokomizo and Antinucci. In 11th was Piquet, ahead of Asmer, Watts, Nakajima, Hamilton, van der Garde, Tung, Jones, Lee and Hiranaka. 21st was Lei, temporarily ahead of Green, while Merszei was the last survivor. Anyway, the race restarted, and Carbone grabbed the opportunity to pass di Grassi, though you could see that di Grassi was planning a counter attack at the first possible moment. Meanwhile Carroll took another run at Perera, and very nearly lost it big time going into Lisboa. He was able to demonstrate his quite remarkable car control and saved it at the last moment, earning a round of applause from the gathered press corps. Hamilton, meanwhile, couldn't hold it all together - trying to pass Nakajima he ended up in the barriers on the run up to Maternity Bend, while elsewhere di Grassi was trying to squeeze past Carbone, only to get the door slammed in his face. However, it was all about to become somewhat academic. Asmer got into a spin at Police, and Hiranaka, Jones and Tung all piled in there, along with van der Garde. Now the track was completely blocked, with cars at a standstill behind them, the drivers having no place to go. It was utter chaos out there, and the officials did the only thing possible under the circumstances. With two laps of the official distance still to run, the red flags were waved, and under FIA regulations the result was declared as at the end of lap 11. 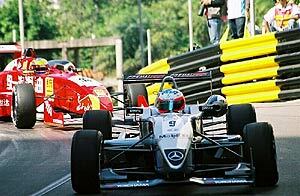 Prémat, the Macau Rookie, had won the race on his and Mercedes' first attempt, becoming only the third man to win both the Marlboro Masters and the Macau Grand Prix (the other two being David Coulthard in 1991, and Takuma Sato in 2001). He was delighted with this result, feeling it made up for being beaten to the Euro Series title by Green. "To win on my debut in Macau against the best Formula Three drivers in the world is fantastic. It's another wonderful experience after my win at the Marlboro Masters and along with my second place it's just terrific. I have to thank my team for making this win possible." Kubica, who predicted that the second row was a better place to be than the front, was proved right, as he and Prémat both started from there. The Pole was pleased with his result, and di Grassi was overjoyed to be on the podium after a somewhat disappointing year in British Formula Three. Carbone was 4th, from Perera, while Carroll and Austin were 6th and 7th, and brought their cars home completely undamaged, to the surprise of team boss Mike Baker. Quintarelli was 8th, while Antinucci and Piquet took up the remaining top ten positions, despite starting from so far back they could probably not even see the starting lights. Asmer was classified in 11th, from Watts, Nakajima and Hamilton, while van der Garde took 15th, ahead of Tung, Jones, Lee, Lei and Green. Merszei, Yokomizo and Hiranaka were the last classified runners.